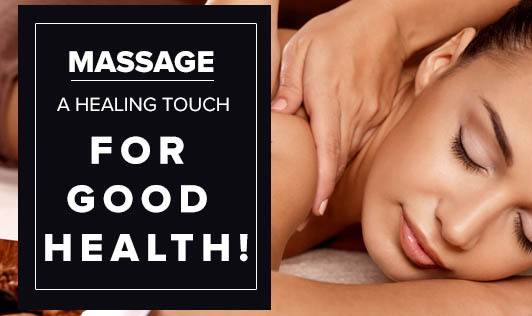 Massage- A healing touch for good health! Massages just don't make you feel good. They actually provide a lot of health benefits. A weekly massage can relieve you from day to day aches, pain, and chronic ailments caused due to a sedentary lifestyle. Also, it is a great way to get pampered after a tedious routine or a heavy exercise session. Let's take a look at few of the many health benefits of massages. High Blood Pressure: A study in the Journal of Alternative and Complementary Medicine says that regular deep tissue massage for 45 to 60 minutes for hypertensive patients reduces blood pressure gradually by 10mm/Hg systolic and 5mm/Hg diastolic. Lower Back Pain: This is one of the most common aches that people with sedentary lifestyles complain of. Health and wellness journals say that certain massage techniques relax the back muscle and trigger the release of endomorphins increasing the threshold to pain. Constipation: Yes, an abdominal massage works as a laxative for constipation. A Swedish study has found out that massages with certain strokes on the abdomen can treat constipation better than oral laxatives. Stress & Depression: A journal on clinical psychiatry has found that massage reduce stress hormones and blood pressure. It is known to boost one's mood by the release of "feel good hormones" like oxytocin and serotonin. So, take your pick from a Swedish, Shiatsu, or Balinese massage. Better Posture: Due to our busy work routines, we tend to slouch a lot and this disturbs posture. Massages loosen the sore muscles caused due to bad posture, allowing the body to relax and position itself in a natural and pain-free posture. Headaches: Chronic headaches and migraines affect most people these days. A recent study showed that head massage twice a week exhibited fewer migraine attacks and better sleep quality. Head massages reduce muscle spasms and stress. Apart from these major benefits, massages also improve blood circulation, increase immunity, and contribute to healthy, glowing skin. A massage scheduled after an exercise session, is a great way to relax and pamper the body. So, go on, get that massage which has been long overdue!